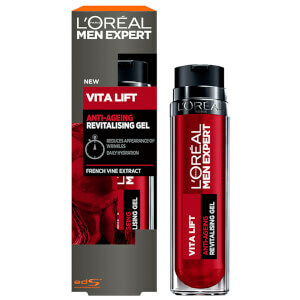 The L’Oréal Paris Men Expert Vitalift Anti-Wrinkle Gel Moisturiser is a revitalising face cream for men. Formulated to hydrate skin while addressing signs of ageing, the anti-wrinkle moisturiser utilises antioxidant French Vine extract to help combat signs of ageing, such as wrinkles and fine lines, and a dose of Peppermint extract to reinforce skin's natural defences against external aggressors (environmental factors known to accelerate signs of ageing). 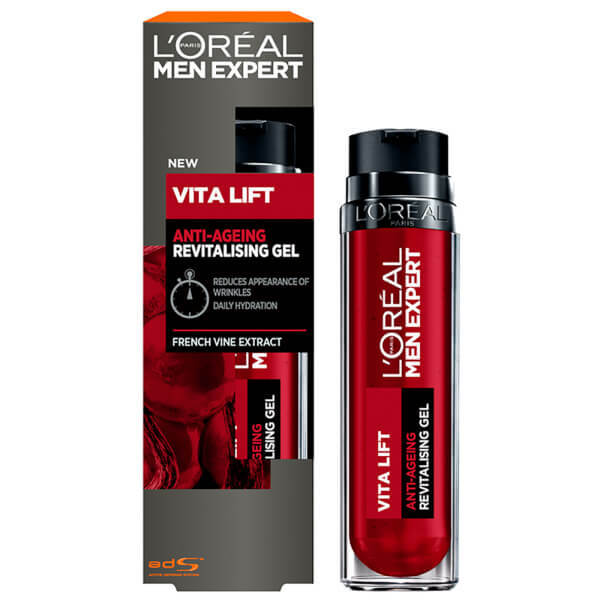 Lightweight, non-greasy and non-sticky, the gel moisturiser melts quickly into skin, leaving it feeling fresh, smooth and hydrated. Apply daily to clean skin on the face and neck, morning and evening. Avoid eye area. Aqua / Water, Alcohol Denat., Glycerin, Cyclohexasiloxane, Hydroxyethylpiperazine Ethane Sulfonic Acid, Caprylic/Capric Triglyceride, Dimethicone, Panax Ginseng Root Extract, Vitis Vinifera Seed Extract / Grape Seed Extract, Mentha Piperita Extract / Peppermint Extract, Carbomer, Caffeine, Sodium Hydroxide, Silica Silylate, Adenosine, Ascorbyl Glucoside, Disodium EDTA, Propylene Glycol, Caprylyl Glycol, Biosaccharide Gum-1, Xanthan Gum, Pentylene Glycol, Faex Extract / Yeast Extract, Ethyl Menthane Carboxamide, Ethylhexylglycerin, Polysilicone-11, Tocopherol, Phenoxyethanol, CI 14700 / Red 4, Caramel, Linalool, Alpha-Isomethyl Ionone, Limonene, Hexyl Cinnamal, Benzyl Alcohol, Benzyl Salicylate, Parfum / Fragrance, (F.I.L. B209527/1).